8 all inclusive days in the Dordogne Region of France at Perigorde Retreats and 5 days in Paris! Contact me now to reserve your spot. Just 5 spots remaining! Registration deadline is June 30, 2018! You don’t have to be a professional artist! Give yourself permission. 13 days to connect to your creative self and others in the antiquity of Dordogne, France. Ask about the $150. CAD referral credit! 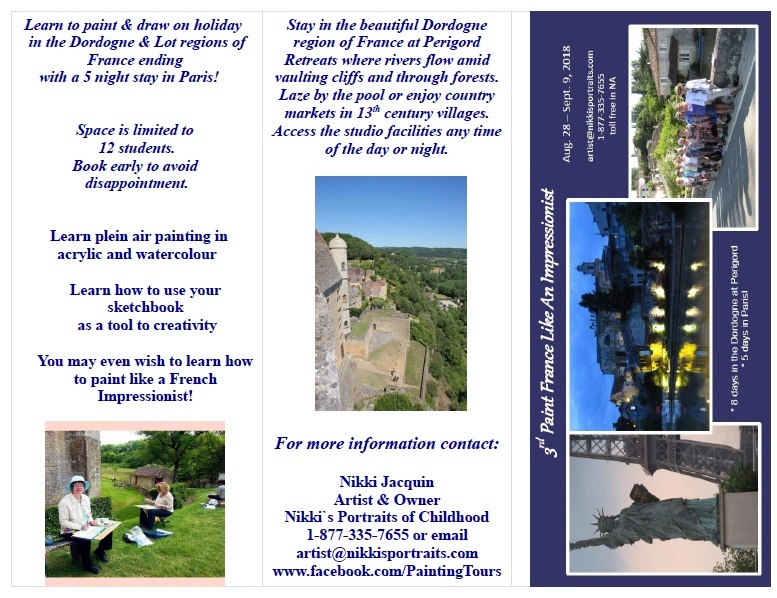 Nikki Jacquin will immerse you in a 8 day all inclusive painting exploration of the Dordogne region followed by 5 days in Paris, The City of Lights! Angela and Adrian, owners of Perigord Retreats, will organize excursions to places such as historic castles, towns, caves and landscapes in the Dordogne and Lot regions sharing a multitude of tales dating as far back as pre history. We will have time to explore, paint on location and time to complete works in the studio and/or soak up the ambiance of the acres of garden and indoor/outdoor pool. Staying in one place means you can be ‘at home’ without the hassle of shifting gear frequently. This trip will celebrate a different pace and our hosts Angela and Adrian will ensure our comfort. We will leave them after 8 days and have a 5 day trip to Paris. Nikki’s role will be to enhance your painting skills as well as challenge you with new ideas and subjects. Non- painting partners and friends will find this tour very enjoyable as well with opportunities for gallery, historical tours, and leisurely sumptuous evening dining! Once we have 10 registered participants, we will then search for best flight pricing! Register early for best pricing! We currently have 5 registered! Register before May 31st, 2018 by calling 1-877-335-7655 toll free! You don’t want to miss this opportunity with just 5 spots remaining! Balance due 60 days prior to commencement of holiday. will be charged 30% (deposit already received). No refund on cancellations after June 29th, 2018. Payment accepted by MasterCard, Visa, or cheque! * It is advised that all participants purchase extensive, health, travel and cancellation insurance. Art instruction by Nikki Jacquin. 24 hour use of on grounds studio space and heated pool. Grotte de Montignac to cave paintings. Group transfer to & from Paris airport. A 5 night stay at Hotel Muguet, within walking distance of the Louvre & Eiffel Tower! Private tour by English Art historian of the French paintings area in the Louvre. All breakfasts at Hotel Muguet. 2 day Hop on Hop off bus pass of Paris. Visit to the Sennelier Art Supply Store that was frequented by many French Impressionists and Van Gogh. Painting instruction by Nikki Jacquin.